Tonight I wanted to delve a little deeper into something I mentioned in my last post. We were discussing seasonal hurricane forecasts and how the forecasted El Nino conditions factor in. The above images show the different ENSO conditions. 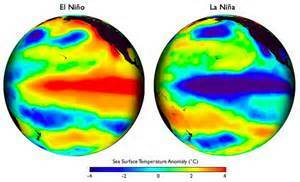 In El Nino, the surface water in the eastern equatorial Pacific is warmer than average. In La Nina, the reverse occurs and this same region is cooler than average. For a more complete explanation visit this page from NASA’s Earth Observatory. The truth is meteorologists have noticed a trend between El Nino (or La Nina) conditions and the resultant hurricane activity. During El Nino conditions, as opposed to La Nina or neutral, hurricane activity in the North Atlantic is considerably diminished. El Nino conditions at the surface create a strong north-south horizontal temperature gradient over the equatorial Pacific. Above these horizontal temperature gradients are were jet streams set up due to a force called the thermal wind (which we may cover in a later post). 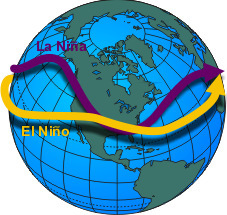 During El Nino conditions the jet stream in the Northern Hemisphere is further south than usual. This jet stream, flying through the upper levels of the troposphere, dips through the Caribbean Ocean and travels over the southern portions of the North Atlantic. This is where hurricanes form and THAT is the big connection! Wind shear. Yes wind shear. I’ve mentioned it before and I’ll mention it again. Vertical wind shear is the change in wind velocity or direction with height. With the jet stream over the hurricane formation region, the region acquires a considerable amount of wind shear. This is not conducive for hurricanes as vertical shear pulls energy away from the center of the storm. Vertical wind shear will inhibit tropical storm formation or tear existing storms apart. So that’s it. El Nino pulls the jet stream south and creates enough vertical wind shear to hinder hurricane activity. So how big of a difference does it make? So that’s all for tonight. My next post will hopefully be the first of several posts I write about my favorite subject, weather modification and it’s uses in a changing climate.